The history of St. Michael’s begins with the construction and consecration in 1817 of Christ Church in Guilford, the first Episcopal Church in Vermont. At that time Guilford was the largest town in this corner of the state and had been the center of political and commercial activity. However, Brattleboro was already growing while Guilford was declining. 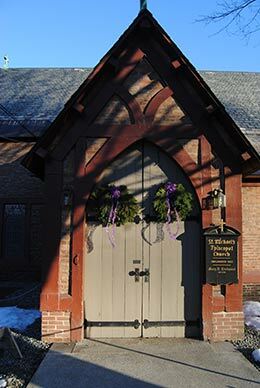 As early as 1835 a group known as the Episcopal Society of St. Peter’s was meeting in Brattleboro. 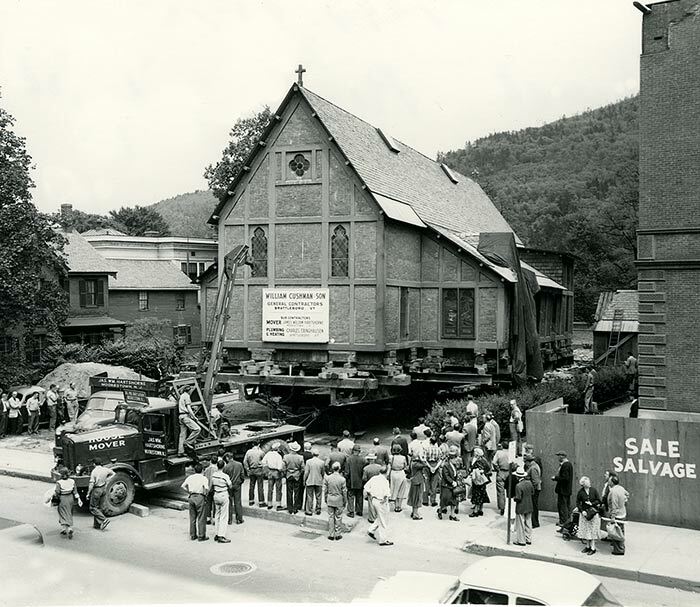 Arrival of the railroad in 1849 secured Brattleboro’s dominance as population center for this area, and soon thereafter a group of residents sought to establish an Episcopal church in Brattleboro. In July 1853 John Henry Hopkins, first Episcopal Bishop of Vermont, visited Brattleboro and expressed his hope for the official establishment of a new church. This hope was fulfilled in September 1853 when a group of eight men met to organize “The Parish of St. Michael’s Church Brattleboro.” A group of women had earlier formed “The Episcopal Female Sewing Society, Brattleboro” to support a new church. Other people who helped financially were summer residents and visitors at the Brattleboro Water Cures. Almost immediately there began a movement to construct a church building. This involved fundraising with the goal of $5,000, which was quickly exceeded, and land on Main Street was purchased where Key Bank is now located. Plans for the new church were provided without charge by New York City architect Joseph Coleman Hart, an advocate of Gothic style for churches. For St. Michael’s he designed a small parish church building in the English Tudor style, with exposed chestnut beams and red brick. 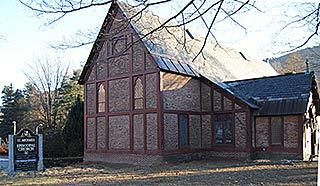 The first services were held in the new building in July 1858, and it was consecrated in 1863 by Bishop Hopkins. The ensuing 100 years were typical for a small parish, with a succession of rectors and financial challenges. As Brattleboro was growing and changing, the downtown location became difficult to maintain and had no space for expansion. At the same time its value for commercial development was increasing. In 1953 the Main Street lot was sold, a new lot was purchased, and the building was moved up Main Street and Putney Road to its present location on Bradley Avenue. The new rectory next to the church was built in 1953, and in 1962 the Bradley-Aldis Memorial Building was added. In 2013, St. Michael’s completed another major construction project, which made St. Michael’s building completely accessible, more efficient and better aligned with St. MIchael’s vision for the future. In addition to renovations, St. Michael’s build a new chapel, The Chapel of Mary Magdalene the First Apostle. 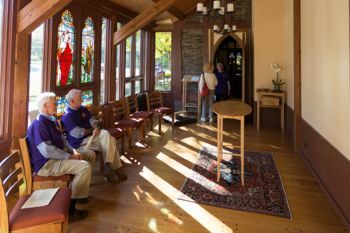 The Chapel supports St. Michael’s growing contemplative and worship community.